Leading energy group Shell said it has joined hands with College of North Atlantic Qatar (CNA-Q) to launch its Maharat Qatar programme aimed at developing youth skills. As part of this sponsorship, the Qatar National Robot Olympiad (NRO) 2017 took place at Aspire Ladies Sports Hall, involving over 500 students from elementary, junior high and senior high schools from across the country. 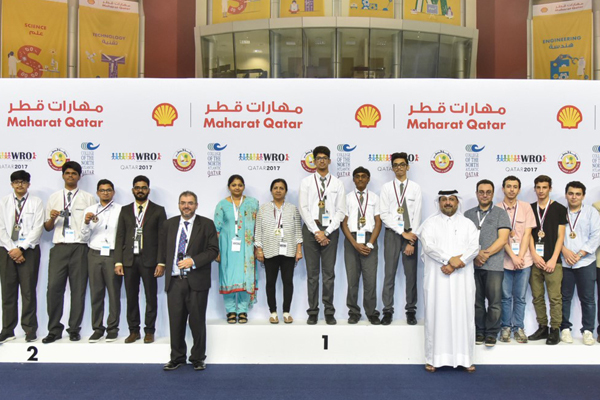 Maharat Qatar is a program sponsored by Qatar Shell to support student engagement and skills in STEM (Science, Technology, Engineering and Mathematics) subjects, and to promote the application of technology which will enhance the learning environment for students. Andrew Faulkner, the managing director and chairman of Qatar Shell Companies, said: "We are proud to be sponsoring Maharat Qatar 2017 with the CNA-Q, which we believe will support the Qatar’s vision of nurturing the next generation of leaders in the STEM area in-line with the human development pillar and Qatar National Vision 2030." Dr Ken MacLeod, the president of CNA-Q said: "This weekend has been a truly magnificent display of talent from Qatar’s best and brightest. Giving students the opportunity to compete against their peers in robotics activities helps harness their creativity and introduces them to the wonderful world of STEM." "The Maharat Qatar program speaks to the power of applied learning, so students can experience the importance of STEM, and encourages the pursuit of these subjects once they reach post-secondary," stated Dr MacLeod. STEM careers are vital to growing and advancing Qatar’s economy, he added. Maharat Qatar tests the limits of the problem solving, engineering, teamwork and programming skills of the students, said the statement.